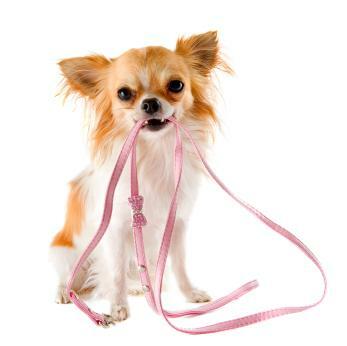 Selecting the perfect dog lead is key because different types of leashes are suitable for different situations. From leather to nylon to metal, learn about a variety of leashes and how they're used before you buy one for your pet. Most leashes are made from either leather or fabric, and both choices have advantages. Nylon is, by far, the most common material used by leash manufacturers. It's inexpensive, and it can be festooned with all sorts of eye-catching patterns. These leashes can also take a spin in the washing machine after a particularly dirty walk, and they might emerge just as clean and sparkling as they were on the day they were purchased. A nylon leash does have some drawbacks, however, as the fabric tends to have sharp edges that can slice right through fingertips. Nylon leashes with cotton-based comfort grips are ideal, as they have all the benefits of this inexpensive fabric without any of the dangers of rope burn. Leather is another popular choice for dog owners because this fabric has a bit of natural give and flex. Dogs that pull and strain at the leash might also be easier to control with leather since an owner can simply grab the fabric and pull it back without worrying about abrasions or scrapes. Those who choose leather should be prepared to spend up, however, as inexpensive leather leashes often have weak stitching and poor construction that allows them to snap during use. Dogs come in all shapes and sizes, and leashes should reflect each pet's unique shape. In general, smaller pets need leashes that are thin, with tiny collar clips. These leashes give owners control, but they don't require the dog to carry large amounts of metal or feel the pull of yards of fabric on their sensitive necks. Large-breed dogs, on the other hand, need leashes that are a bit sturdier and stronger, with larger clips that can attach to a larger collar. Thicker leashes are much more appropriate for dogs of this stronger stature. It's also important to get a leash that is not too heavy for your dog. If your leash is too heavy, you'll end up confusing your dog while training him as he'll think you're pulling on the leash when you aren't. The length of the leash should be dictated by the situations in which the leash will be used. 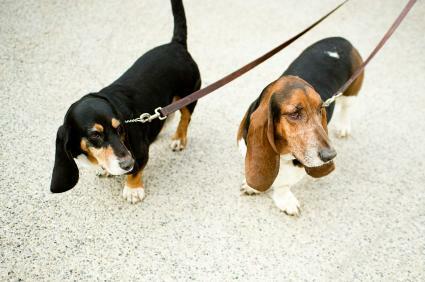 In general, the leash should get shorter in direct proportion to the number of people the dog will interact with. In-city walks, for example, might merit a leash that's quite short, so the dog won't be allowed to run into traffic or trip up pedestrians. Leashes for a quick tie-out in the yard might be longer, so the dog can sit down or lie down comfortably. 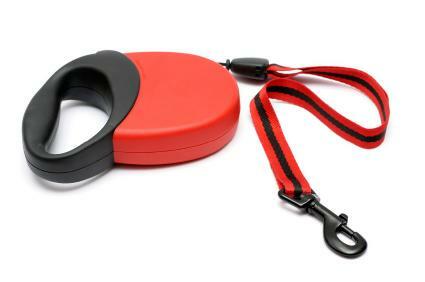 Some owners find it's reasonable to buy both a long and a short leash, so they have the right tool at hand for almost any situation they'll encounter. Another factor to consider is if you are required to have a certain length by your state or local park, or in any competitions that you might be entering the dog into. Other states have specific leash laws, but may not specify an exact length. If you intend to show your dog, you're going to need to check the rules to make sure that your leash is the appropriate length and material. The standard is often 6ft., but do double check the guidelines for the show that you plan on participating in, as the length and material can vary. While there are a host of leashes on the market, and most are deemed safe, there are a few leashes that you probably want to avoid. Some people who use these leashes absolutely adore them and claim the leashes provide a flexibility they just can't obtain with a standard leash. Some experts, however, find these leashes somewhat troublesome, as people who use them improperly could be hurt. 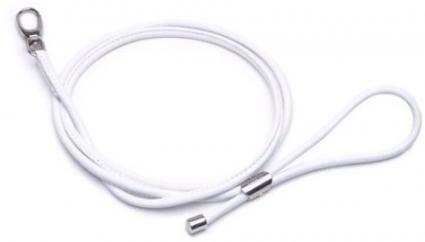 The Consumer Product Safety Commission suggests that 16,564 injuries due to retractable leashes in 2007 had to be treated in hospitals, which suggests just how dangerous these products can be. Some people grab the line as their dogs run away, and the fabric slices through their fingers, while others are pulled off their feet as dogs on retractable leashes obtain huge momentum as they run. They might start 10 feet behind an owner, and when the leash hits its end, dogs have been running for quite some time and might have tremendous speed. While a flexible leash might be an acceptable choice for an owner with a small dog and a significant amount of verbal control over that animal, there are some leash types that are so dangerous that they really can't be recommended for anyone. Metal leashes made of thick loops and coils of stainless steel or chrome, for example, might seem strong enough to handle the sturdiest dog, but these products can also snap back on a bolting dog and chip that creature's teeth or lacerate an eye. These metal bits can also cause nasty burns if owners grab the materials on a dog that's running. These leashes just can't be considered safe. Leash styles and details change as frequently as the seasons, so keeping up with the latest upgrades can be a bit difficult. Organic Pet Digest does a great job of reviewing new leashes, as well as old favorites, so a quick click on this site can help a shopper find the latest-and-greatest gear before making a final decision. With that said, there are a couple tried-and-true brands you can always count on for quality leashes. For those dog walkers looking for comfort and quality, leashes from Lupine are a good choice. These leashes have a padded handle, so they're easy to grip, and the snaps swivel, which reduces tangles and twists as the dog moves from side to side. Lupine leashes are also guaranteed for life. If the leash decays due to owner neglect, or the leash has tears and tangles due to enthusiastic dog play, Lupine will replace the product with no questions asked. For a few more dollars, owners can purchase an Italian-crafted leather leash from Petego. These leashes age beautifully, developing a fine patina and a smooth texture, and the metal details along the handle of the leash can appeal to even the most fashion-conscious dog owner. All leashes, no matter what type, should be inspected daily, just to ensure that they're in good shape and can handle the demands of yet another stroll in the great outdoors. Frayed bits, loose clips or bursting seams all might indicate that another shopping trip is in order before another safe dog walk can take place.